The entire ModulesGarden gathers here, on the eve of the most beloved holiday of the year, to wish you all a wonderful Valentine’s Day! Love comes in many different shapes and forms. One can love their family, their pets, and even inanimate objects that simply spark joy for you. We hold dear each and every single piece of our software that is designed, developed, and delivered with special thought about you. Using this rare occasion we would love to spread some affection to you as well, and express our gratitude for your continued support through a bountiful promotion. offered on our Marketplace with a sweet 14% discount! 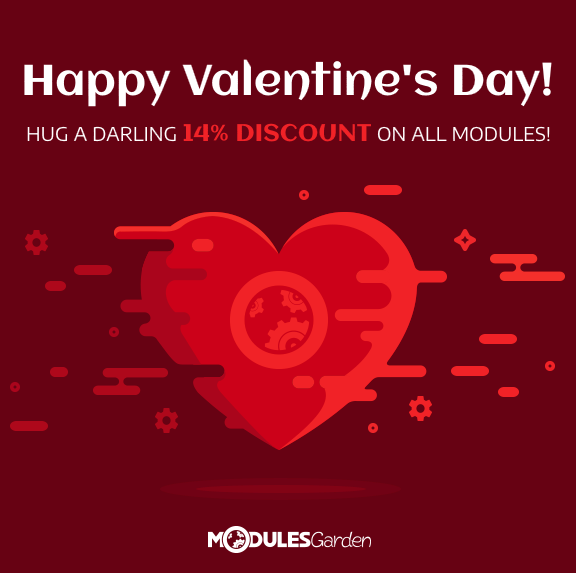 All you need is love ♫ …and the promo code that can be found nowhere else but in our ModulesGarden Widget For WHMCS. Still don’t have it? No worries, you may easily download it from our website, and completely free of any cost! Please keep in mind that the promotion lasts until the end of 15th February, 2019 only. The clock is ticking so hurry on and choose your perfect Valentine’s Day gift! Head over to the Product Marketplace! It says ‘annual licenses’ but I guess it is a one-time discount again, right? As we don’t want to fall for that one again. Yes, the discount is of a one-time type, but it can be applied to both new orders and renewals, so that’s a win-win! Ok, thanks for clearing that up and we’ll not use it then.